It sure has been hot this week. So hot, in fact, that any time I have to brave the outdoors, I'm dizzy and seeing hypocycloid stars within minutes. Let's cool down and kick off the weekend with a refreshing, Steelers-inspired cocktail. This drink is also partially inspired by my new (and new favorite) shirt, courtesy of the nice folks at Homage. Their Three Rivers Stadium shirt was featured on the site this past Tuesday for the anniversary the of stadium's opening on July 16, 1970. I snapped one up and it arrived on my doorstep faster than I could say "Fuamatu-Ma'afala." Before we make our cocktail, which has a trio of ingredients (to represent the Ohio, Allegheny and Monogahela Rivers) AND a trio of garnishes (to represent the three diamonds in the Steelmark logo), let's brush up on the history of Three Rivers Stadium and the Steelers' logo. Three Rivers was the Steelers' first true home, where they played from 1970-2000. The team had previously shared both Forbes Field with the Pirates and Pitt Stadium with the Panthers. 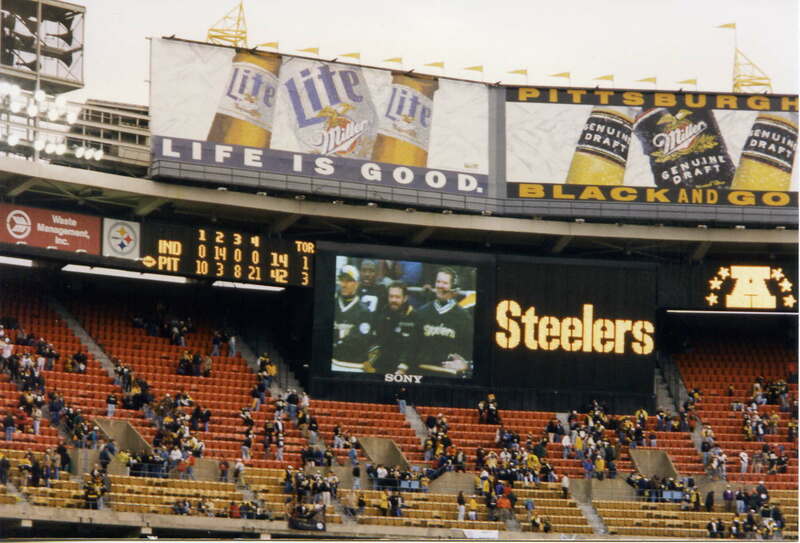 Three Rivers saw seven AFC Championship games in 30 years, four of which the Steelers won. It was the site of the most-covered, most-infamous play in NFL history, The Immaculate Reception (which, you may recall, we watched and discussed in our last cocktail post). Republic Steel of Cleveland (plot twist!) 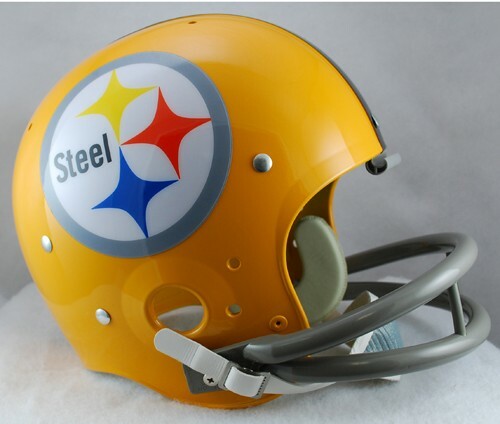 suggested in 1962 that the Steelers use the Steelmark on their helmets. The team added the logo to only the right side of their then-gold helmets to test out the new look. That season, the Steelers made the playoffs for the first time in their history. The helmets were changed from gold to black in an effort to better showcase the new logo and the team decided to keep the "one-sided" look. To this day, the Steelers are the only NFL team with an emblem on only one side of their helmets. The final change came the following year when the Steelers put in a request with AISI to allow them to alter the original Steelmark by changing the text from "Steel" to "Steelers." This drink recipe comes from our mixologist consultant, $Bill. The yellow, red and blue hypocycloids are frozen in ice! I also used homemade limoncello that was given to me as a holiday gift from a friend and colleague. If you like, you can follow this recipe to make your own - or pick some up from the store! Perfect for a summer day. Place fruit in empty ice tray. Carefully pour water over fruit to fill tray and freeze. Remove frozen fruit cubes and place in glass. Pour in limoncello, vodka and tonic. Stir and serve.